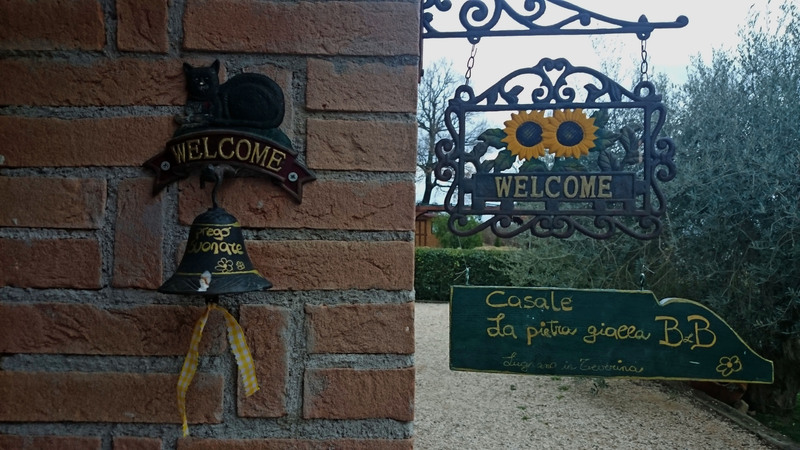 Casale La pietra gialla is not a hotel but is a Bed&Breafkast, we provide some rooms of our house and share with our guests the garden and the pool. Of our family also belong cats and dogs please keep this in your choice. Our is a tipical stone house with panorama view on the Tiber Valley, easy to reach from the Highway A1 (exit Attigliano about 10 km) and at few minutes drive from the medieval village of Lugnano in Teverina. Only 3 rooms with private bathroom and indipendent entrance; seasonal outdoor swimming pool (15 june to 15 september); garden; terrace; parking; free WiFi. Guests can enjoy pool views. An Italian breakfast (sweet) is served each morning at the property. On request without supplement jam, cheese, eggs. Good start point to visit Umbria and Tuscia; paradise for mountin biker and trekking, horse riding in the nearby. Orvieto is 23 km from Casale La pietra gialla, while Viterbo is 23 km away; Rome Fiumicino airport at about 90 minutes. Pets are welcome (small/middle) with a supplement of €10 daily. SPECIAL EASTER ADVANCE BOOKING period 30 march to 2. april ; €140 for 2 nights; €200 for 3 nights. if you book within 15 of march. SUPER SPECIAL period 28 february to 29 march €96 for 2 nights; €52 for 1 night.